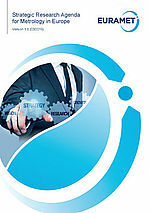 The Strategic Research Agenda for Metrology in Europe (SRA) has been developed to provide a high level strategic view of measurement capability requirements which may be delivered not just by the European Metrology Programmes, EMRP and EMPIR, but by the wider research community involved in measurement-related programmes regionally, nationally and internationally. The SRA has been prepared by EURAMET with inputs from the EURAMET Technical Committees and Task Groups in consultation with their stakeholders. To engage the broader stakeholder communities in the development of the SRA, the document was subject to an open consultation in 2015. Source: https://www.euramet.org/research-innovation/sra/© 2019 EURAMET e.V. is a non-profit association under German law.